DGM Releases New Video For "Animal"
Frontiers Music Srl has announced the release of the brand new album from Italian prog metal masters DGM, entitled The Passage, on August 26th. The Passage is DGM's eighth studio album and is the culmination of almost 20 years of hard work that started back in 1997 with the release of their self-produced mini-album, Random Access Zone. The band went through several incarnations and lineup changes during the years, but since singer Mark Basile joined the group in 2007, DGM evolved and developed their sound into what they have now become. The first video for the song "Animal" has been made available for streaming. Check out the video on KNAC.COM right HERE. Then be sure to pre-order your copy on Amazon and iTunes. When you do you will receive an instant grat track download of "Animal". It was probably the release of Frame (2007) that pushed the band into the top of the league of international prog metal. It was also on the strength of this material that DGM managed to tour for almost four years around the world, taking part in some of the biggest metal festivals, supporting SYMPHONY X on their European tour, and sharing the stage with PAGAN'S MIND too. In 2013, DGM came back with Momentum, an album which showed the full stylistic maturity of a band which felt fully confident with their abilities, both on the songwriting and the musicianship side. The last album was promoted with more shows and after several gigs in Europe, they performed for the second time at ProgPower USA and started their first Asian tour in November 2014 playing Beijing, Tokyo, Nagoya and Osaka as headliners. 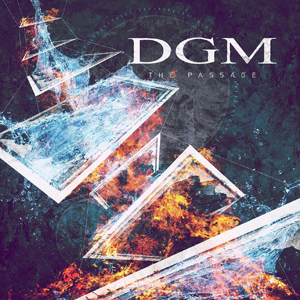 The new album, The Passage is another substantial step forward for DGM. Sounding like a hungry, urbanized version of SYMPHONY X, with substantial hard rock influences, the new record is remarkable in several aspects. The compositions are phenomenal, with sweeping choruses, technical passages, lightning fast fretwork, big vocals and bombastic transitions. The playing is simply faultless and the melodies are perfectly woven into the killer guitars, epic keyboards, and pounding drums! "This album can easily be seen as our most ambitious work to date," says guitarist and producer Simone Mularoni. "This time we tried to evolve to an even more personal sound. We took all the elements we developed through all these years and we tried to take them to the limit. Throughout the whole record you will hear a recurrent musical theme. Instead of doing a usual concept album with the lyrics, we decided to do a sort of musical concept with this melody that repeats in every song but every time with different time signatures and keys," tells drummer Fabio Costantino. "This album will offer to the listener a key for a positive dimension. A path made of sound vibrations: The Passage to our dreams and hopes," concludes bassist Andrea Arcangeli. EVERGREY singer Tom Englund and SYMPHONY X guitarist Michael Romeo also appear as special guests tributing the value of this outstanding album. And let's not forget the great job that producer Simone Mularoni did in the studio! The future looks bright for these guys! Check them out live when they come to a town near you! The band was also announced as part of the line-up for the first ever Frontiers Metal Festival. Full info here: http://www.frontiersmetalfestival.com/. Tom Englund - vocals on "Ghosts Of Insanity"
Michael Romeo - lead guitar on "Dogma"